From its ancient Aboriginal roots, the city of Darwin has evolved over the centuries from a remote European outpost to a prosperous colonial capital and, finally, into the modern city we see today. It is the main city on Australia's vast northern coast, which makes it among the most tropical of all the country's settlements. From Japanese bombings to brutal cyclones, the short history of Darwin is one of destruction and rebuilding. Yet this resilient city always pulls itself back up onto its feet. Although many Larrakia-speaking Aboriginals had been living around the site of Darwin for thousands of years before outsiders discovered Australia, the city itself did not come into existence until the end of the 1800s. The sheer size of Australia and the remote location of Darwin, in the Northern Territory, precluded Europeans from making any attempt to settle here until the country's infrastructure made it feasible, which accounts for the city's relatively short history. Crew members on the English ship HMS Beagle were the first Europeans to set eyes on Darwin harbour in 1839. The captain named the port after Charles Darwin, who had sailed with him on the same ship during an earlier expedition. It wasn't until 1869, however, that the British decided to build a permanent settlement here. 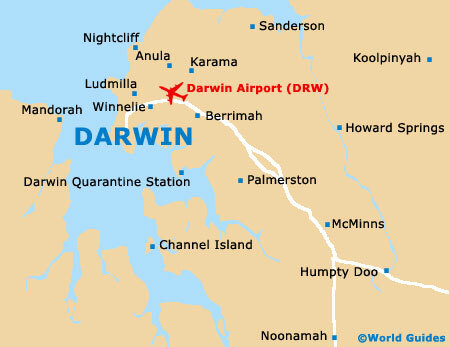 It would be another 42 years until Darwin became the city's official name in 1911. The first settlement around Port Darwin was named Palmerston after Lord Palmerston, the British Prime Minister between the years of 1859 and 1865. It was immediately used as a commercial port to supply the settlement, and within a few years, the Australian Overland Telegraph Line connected the town to Adelaide on the southern coast, and onwards to England and the rest of the world. The settlement got off to a slow start, boosted by the discovery of gold roughly 200 km / 125 miles away, but it was frequently hampered by major storms that damaged the young port town. The most significant event in the history of Darwin came during WWII, when the Japanese bombed the port city in February 1942. In two waves, almost 190 Japanese fighter planes attacked the city. This was the exact same fleet of planes that attacked Pearl Harbor in Hawaii, although they dropped significantly more bombs on Darwin than on Pearl Harbor. The attack caused massive destruction to the town and killed in the region of 250 people. In terms of fatalities and damage, these attacks were by far the worst events to hit Australia during the war. And, this was just the beginning. Between 1942 and 1943, the city was attacked just under 60 more times. After WWII, Darwin rebuilt itself but constantly seemed to find itself under attack from Mother Nature. In 1974, a brutal storm named Cyclone Tracy rolled over the city, destroying around 70 percent of the buildings and infrastructure, and killing some 71 residents. It was Australia's worst natural disaster ever and when it was all over, nearly 75 percent of the population had been airlifted out of the city. 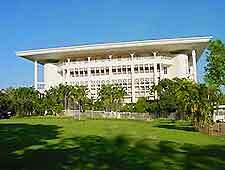 In the aftermath, Darwin was rebuilt again, but this time every building had to be cyclone-proof. Darwin remains the most important urban centre in the north of Australia, providing a tether between the tropical north and the heavily populated coastal cities of the south. It is almost certain that future natural storms will hit the city, but when they do, the citizens here believe they will be prepared.